Immunotherapy: Treating with Fewer Allergens? 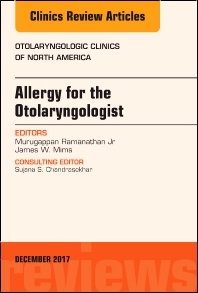 This issue of Otolaryngologic Clinics, Guest Edited by Murugappan Ramanathan Jr. and James Whitman Mims, is devoted to Allergy for the Otolaryngologist. Articles in this issue include: New Horizons in the Management of Allergy; The Role of the Sinonasal Epithelium in Allergy; The Role of Allergy in Chronic Rhinosinusitis; Manifestations of Inhalant Allergies Beyond the Nose; The Role of Allergy in Otologic Disease; Asthma Management for the Otolaryngologist; Rational Approach to Allergy Testing (in vitro/in vivo); Advances in Food Allergy; Contemporary Pharmacotherapy of Allergic Inflammation; Clinical Applications of SLIT; Efficacy of SLIT/SCIT; Immunotherapy: Treating with Fewer Allergens? ; Management of Anaphylaxis; and Future Horizons in Allergy.